Revolution in the global market of asset tokenization. Innovation and pioneering in the commercialization of Brazilian National Treasury Bonds and Traditional Investment Assets. Creation of ANDES Investment Platform to convert traditional Latin American assets into Worldwide trading tokenized assets, smart contracts and security tokens. The Attainability never achieved in the history of the financial industry. If your pain as an investor are low interest rates and deflation, subscribe and learn how to invest with us. latœx is the world's first platform to digitize and trade National Treasury Bonds. They will be issued by a Brazilian investment bank, and the entire chain will profit from the market improvement. From fixed-income and equity futures to art works. From securities and utility tokens to commodities, you can trade any of them using ANDES Investment Platform. Investors are trading with small fees using ANDES Investment Platform. latœx systems were built and updated with our customers in mind. Starting from your account opening, to managing your account, depositing or withdrawing funds and finally trading. It’s all straightforward simple and easy to use. latœx runs high-level multi-layer security protocols that prevent hacking attempts and increase the protection of your funds. ANDES (Autonomous and Decentralized System) is the safest, most friendly and fastest trading platform in the world, allowing investors to trade digital assets worldwide. 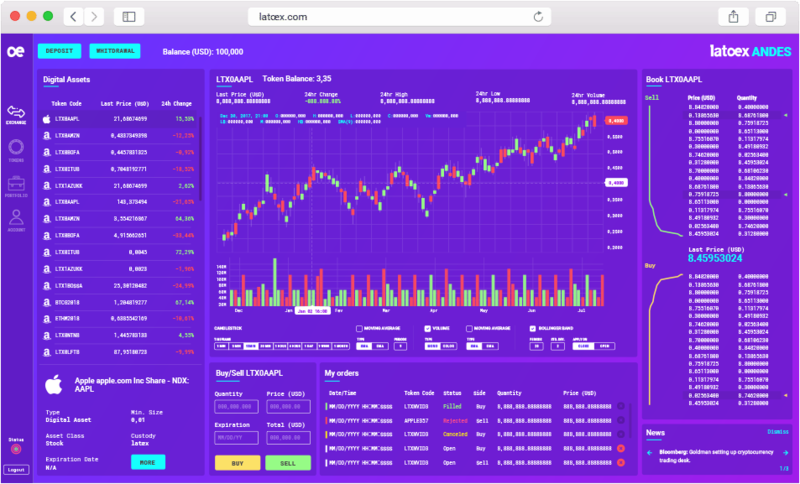 This is a latœx curated digital asset database. It includes tokens, app coins, cryptocurrencies and crowdfunded blockchain assets. latœx is a private limited partnership incorporated under the laws of Estonia and also following the best practices indicated by the European Union regulations regarding the public issuance of tokens while a coin, a utility or a security, also falling under the provisions and obligations related to AML-CFT and KYC procedures from that region. The offers of tokens within the latœx platform is intended to be available to international investors based worldwide, excluding those investors with residence or nationality from Brazil, Canada, China, Estonia and United States of America (Investors from those regions may access some basic features of the platform but they are not allowed in any reason whatsoever to perform any acquisition of tokens nor negotiation of tokens that may have at your possession using the latœx platform). latœx does not verify information provided by token developers and other users on this platform and makes no assurance as to the completeness or accuracy of any such information. All users, buyers and participants must conduct their own due diligence of each network or proposed network, as well as the risk associated with distributed network tokens as a new asset class. Token developers may possess material information not known to investors or the public about the network, its implementation and its tokens. All activities on this site are governed by our terms of service. The purchase of network tokens and cryptocurrency are particularly risky and may result in total loss of capital. Roadmap proposed for a network (i.e., "white paper") is subject to change or implementation failure. An implemented network may not be adopted, resulting in its tokens having low or no value. Past performance of a network or a cryptocurrency is not indicative of similar future patterns. Only sophisticated users who understand the risks of speculative investing in new asset classes may participate on this platform. No investment advisory activities, in no reason may be conducted and supervised by latœx.